Belfast 1988: a drug dealer is found murdered in front of his house, killed with a bolt from a crossbow. Sean Duffy, of the Royal Ulster Constabulary, is called to investigate. Now a family man – girlfriend and baby daughter living at home – Duffy is initially grateful to be working a homicide; something a tad spicier than his recent fare. But solving this case leads Duffy to a confrontation with the dangerous villains he’s ever faced; the kind who won’t just be satisfied ending his life, but those he cares for most deeply. Duffy remains a superbly drawn character, sardonic yet assured, and now struggling to cope with his new responsibilities as a father. McKinty writes laconic, sophisticated, well-paced thrillers, and Police at the Station and They Don’t Look Friendly is his most refined novel yet. Some authors make you laugh; others make you gasp. McKinty can do both, usually in the space of a couple of paragraphs. His latest is multifaceted, layered, and intense – the kind of novel you’ll blow through in one sitting. In the past, when interrogated on my favourite crime writers by friends, family, and indeed customers at Pages & Pages, I’ve always said McKinty is up there with the best writers in the business. With Police at the Station and They Don’t Look Friendly he has set down a potentially unsurpassable marker. Check out Jon Page’s Review! My thanks to Seventh Street Books for providing a digital proof copy for review. If there was ever any doubt, Rain Dogs proves Adrian McKinty’s name belongs right up there with the legends of the genre ― and that the return of Sean Duffy warrants as much celebration as the release of a new Bosch or Rebus novel. In the fifth installment of McKinty’s Sean Duffy series, the spotlight is shone on the increasingly weary, but no less dogged detective inspector, in 1987; still dealing with the violence of The Troubles, and being a Catholic policeman in the hostile Royal Ulster Constabulary. Then there’s another failed relationship – a woman who’d rather be anything than a policeman’s doting wife – and the conundrum of a ‘locked room’ murder case. The death of Lily Bigelow inside Carrickfergus Castle is deemed a suicide by Duffy’s colleagues. At first glimpse, there is no evidence of foul play, and the castle was locked and sealed shut when the young reporter died. The only thing keeping the case open and unsolved is Duffy’s inkling that there is more to Lily’s death than meets the eye; some of the finer details aren’t coalescing into a cohesive whole. And despite protestations from his superiors, and forces above even them, Duffy’s never backed down from political pressure; it’s justice, not appeasement, that matters most. cKinty is a master of pacing, stretching out the mystery, and peppering its procedural elements with bursts of earned emotional gravitas. Indeed, even as the intensity of Duffy’s investigation subsides, something else in his personal life rises to the occasion, and proves just as compelling, and in one instance, has everlasting consequences for the series. It’s a sure bet that you won’t read a tighter-plotted, richer-peopled, enthralling page-turner of a mystery this year. RAIN DOGS (9781633881303) in exchange for an honest review. Belfast, 1985, the height of The Troubles: amid the gunrunners, riots, and the Ango-Irish Agreement, there is no such thing as a routine murder investigation. Northern Ireland is a powder-keg just waiting to explode, and every case has the potential to further ignite the situation. The murder of a wealthy couple, followed soon after by the apparent suicide of their son, who takes responsibility for their deaths, doesn’t appear to be fuel for the fire: it seems open and shut, ready to be filed and forgotten. Until the body count continues to rise, and the political implications become clear. Given his roguish brand of policing – alongside questionable lifestyle choices, including a coke habit and the requisite heavy-drinking – Detective Inspector Sean Duffy might not seem the obvious candidate to investigate such a sensitive case. But it’s precisely this renegade streak that makes him such an effective sleuth. With an aura of fearlessness and an underlying arrogance, Duffy delves into the murky, dangerous world of a covert US intelligence force, making plenty of enemies along the way. New readers will miss some of the more nuanced moments, and references to former characters, but Adrian McKinty’s fourth Sean Duffy novel reads perfectly as a standalone. 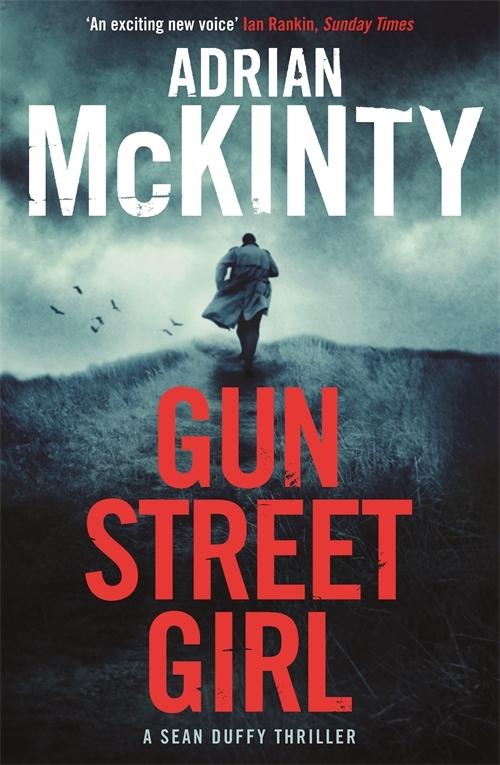 GUN STREET GIRL segues into a potential career move for Duffy, and dips into his social life (or lack of), but the investigation remains its focus, moving along at rapid pace. The climactic shoot-out is a tad humdrum – a finale with less noise might’ve had more punch – but the novel’s final twist erases any misgivings about that. Deftly plotted, and punctuated with dark humour, GUN STREET GIRL is a fine thriller, demonstrating how one of the most persistent cops in the business will do whatever it takes to crack a case.